Welcome to Our 2015 Summer Issue of the South Shore Magazine. This is what most of us have been long awaiting after enduring this past endless winter from Hell. Long days, warm winds, shorts, tee shirts, parades, fireworks, biking, swimming, cooking outside, gardening, fishing, boating, camping, days at the beach and fires for ambiance instead of heat are all things that come to mind for me for summer. Whatever your idea of summer fun is, go out there and get it and savor it! We have some features on great summer fun, we have a wonderful 4-page article on Hornstra Farms in Norwell as they celebrate their 100th year! The farm on Prospect Street is a working dairy farm that John Hornstra and his family have painstakingly revived and restored. The farm is open to the public for viewing the cows and more importantly serves THE BEST ICE CREAM on the South Shore that is made right on the premises. You may also purchase a vast array of their other farm fresh products in the farm store. Rich, creamy and deliciously decadent! We also have features on 2 great groups: Friends of Hingham Harbor and Old Colony Running Club. Erica Ford, one of my co-hosts on South Shore Live, Monday nights from 8-10 PM on 95.9 FM WATD has a great satirical throwback to summers in the 70’s, you’ll love it! 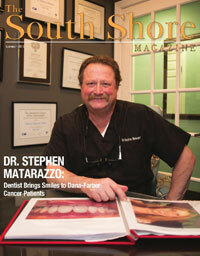 Our feature article and front cover are focusing on the Quincy dental practice of Dr. Steven Matarazzo and his truly paying it forward to support cancer patients in their quest. On the topic of paying it forward, Road to Responsibility (RTR) of Marshfield with Chris White and his magnificent staff at the helm pay it forward EVERY day for the special needs community. Hat’s off to RTR! This issue’s Great Taste section highlights some great summer wines from Marsh’s Wine and Spirits in Norwell that they featured at the North River Arts Societies Annual Festival of Arts on Memorial Day weekend. Marsh’s is the destination for all of your summer libations. Their extremely well-educated staff can help you with any questions or suggestions that you have or need. I also had the pleasure of meeting with the owner of Old Colony Brewing in Whitman. This nano brewery is on a really nice growth trajectory and has several really popular beers to offer, check them out! As you have seen in our last several issues of South Shore Magazine and can listen in every Monday night (South Shore Live) in the Curtis Liquors Hour 9 Lounge on 95.9 FM WATD, we are HUGE supporters of the local and regional music scene. Volume 5 of The Beat written by local musician/ producer Jay Psaros and features several of our regions award winning music artists. Enjoy! 2015 Summer Issue ~ READ NOW! ‹ Welcome to Our 2015 Early Spring Issue of the South Shore Magazine. › Welcome to our 2016 Winter Issue of the South Shore Magazine.